These Crisps were reasonably thickly cut and although hard, they were brittle to the crunch. The frying oil had stiffened them up to the stage where shards would break off like splinters of glass. The crunch was sustained throughout the eating process. The Crisps in our test bag appeared a little smaller than the average Crisp. All had a full covering of potato skin, which suggests they were washed but unpeeled at the cutting stage of preparation. There were very few oil boils, but lots of irregularly shaped Crisps. The colouring was a softly diffused yellow, with salty seasoning. A Nose Plunge Test revealed a mild Vinegar aroma. 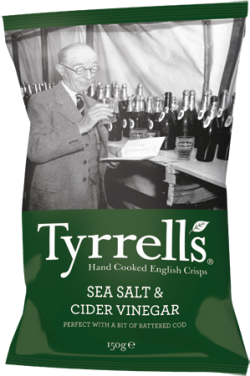 The taste was fairly distinct because although they were Salt & Vinegar Crisps, the twist of Cider Vinegar did make a difference. There was a sweetness to the Vinegar that took all the tartness out of the flavouring. The Salt was a little muted in the partnership arrangement, but it was a pleasing, if a non-traditional variation on one of the world's most popular themes.